** watch the 14-minute news conference here! OTTAWA - Environmental groups are urging the Canadian Nuclear Safety Commission to release a study on nuclear disaster scenarios that they say was suppressed. The commission released a study last year looking at health and environmental consequences of accident scenarios, following the Fukushima nuclear disaster in Japan, but the groups say it wasn't released in full. Greenpeace, the Canadian Coalition for Nuclear Responsibility and other environmental organizations say emails obtained through access to information requests show management at the nuclear commission censored the original draft. Canadian nuclear power plants completing upgrades prompted by Fukushima They say the original study analyzed the impacts of a Fukushima-scale accident at the Darlington nuclear plant, 70 kilometres east of Toronto, but that wasn't included in the version released to the public. The groups cite an email from the director of the Darlington regulatory program division that says it would become a "focal point of any licence renewal" and would be used "malevolently" in a public hearing. The nuclear commission is holding a hearing today in Ottawa on Ontario Power Generation's application to extend the operating life of four aging Darlington reactors and the environmental groups want the Fukushima-scale analysis released before public submissions are due next month. (Ottawa) ‐ Environment groups are asking the Canadian Nuclear Safety Commission (CNSC) today to release a suppressed study detailing the weaknesses of offsite emergency response at the Darlington nuclear station in the event of a Fukushima‐scale accident. “The CNSC has betrayed the public trust by concealing a study revealing risks to Toronto. The study should be released so these hazards can be addressed transparently and appropriate emergency plans put in place,” said Shawn‐Patrick Stensil, a senior energy analyst with Greenpeace. The CNSC is holding a hearing today in Ottawa on Ontario Power Generation’s (OPG) application to extend the operating life of the four aging Darlington reactors 60 km east of downtown Toronto. The procedural request asks for the suppressed accident study to be released by next month so its findings can be used in public submissions to the second round of public hearings scheduled for November. 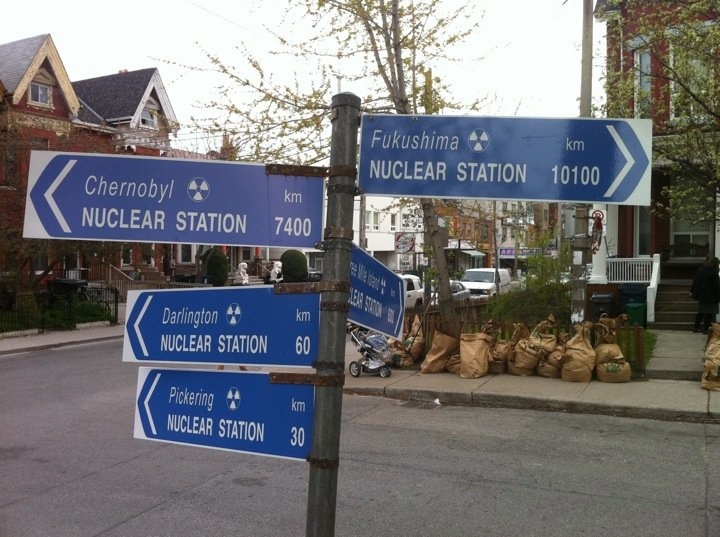 “Following the Fukushima disaster citizens asked the Commission to assess whether emergency response in the Toronto could cope with a major accident at Darlington. It is alarming the CNSC would withhold objective information on the public safety risks,” said Theresa McClenaghan, Executive Director of the Canadian Environmental Law Association (CELA). In 2014, the CNSC did release an accident study and claimed it responded to public concern. But according to Access to Information, the public study is profoundly different from the original draft censored by CNSC management. The censored study analyzed the impacts of a Fukushima‐scale accident at Darlington, but when apprised of the results, senior management instructed staff to redraft the study to consider a much smaller accident. “This is yet another example of how CNSC isn’t accountable to Canadians or objective on nuclear risks. It is past time for the next government to clean up the CNSC by insisting that they put the public interest above that of the nuclear industry,” said Dr. Gordon Edwards, president of the Canadian Coalition for Nuclear Responsibility (CCNR). The groups that filed the request include CELA, CCNR, Durham Nuclear Awareness, Greenpeace, New Clear Free Solutions, Northwatch, Canadian Association of Physicians for the Environment (CAPE) and Sierra Club Canada. A detailed account of what took place at the Fukushima Daiichi nuclear plant beginning on March 11, 2011 is provided in the book Fukushima: The Story of a Nuclear Disaster, by David Lochbaum, Edwin Lyman, Susan Q. Stranahan and the Union of Concerned Scientists (The New Press, 2014). On the Union of Concerned Scientists' Web site there is a detailed description of what the book covers. The book is pretty well-indexed, so readers can look up words/phrases such as “beyond design basis” or “sea wall” or “potassium iodide” or “complacency and overconfidence” & find all the pages on which the particular topic is mentioned. There is also a glossary of terms. As the list below indicates, the book goes into much detail about earthquake & tsunami research (both what was known & what was ignored), how the Japanese nuclear regulator operates, how TEPCO (owner/operator of the reactors at Fukushima) operated in the years before the disaster & then during the early days of the disaster, how the media in Japan operate, how emergency planning broke down, etc. etc. Covered very thoroughly indeed, toward the end of the book, is how the U.S. NRC (Nuclear Regulatory Commission) operates – which, as it happens, has a major bearing on how the Japanese regulator operates. Much of what this book reveals is enough to cause nightmares, or at the very least, some lost sleep – especially if you live in the neighbourhood of an aging nuclear reactor – or 10, as we do here in the Greater Toronto Area (GTA). This document provides a lengthy compilation of quotations from the book. Many more pithy & informative quotations could have been included if recording all these quotes were not so time-consuming! This is a very important book. The problems that this book details about the intransigence of the nuclear regulatory agencies have not begun to be solved. The problems of collusion among regulators & industry & governments have not begun to be solved. Since most "average citizens" (& even politicians) seem unaware that these problems exist (while those in power who do know, deny them), rassling with & solving them will be a very great challenge indeed. In Durham Region (& of great interest across the entire Greater Toronto Area), we’re about to witness an expensive hearing process involving Ontario Power Generation (OPG)’s request to Canada’s nuclear regulator, the Canadian Nuclear Safety Commission (CNSC), for a 13-year license for the aging reactors at Darlington (hearing to take place in early November). People need to understand the kinds of problems that led to the Fukushima disaster that are laid out so very thoroughly in this book. The Fukushima disaster was not caused by the earthquake or the tsunami; it is a man-made disaster that could happen anywhere there are nuclear reactors. ** Note: same deal here in Ontario! Emergency planning predicated on a minor accident, not a major one. Plans = utterly inadequate. Recent editorial from Japan regarding evacuation issues there. P.S. on October 17/15: On October 14th, DNA donated copies of the Union of Concerned Scientists' book to each of Durham Region's eight municipal Councils (& the Regional Chair) & reminded them all of inadequate nuclear emergency planning as well as the untruth of the "It Can't Happen Here" myth. Media article here. Copies were also later given to the Premier of Ontario & to the Minister of Community Safety & Correctional Services (the provincial ministry in charge of emergency planning). 10 reactors in the GTA, 10 reactors near Toronto, aging reactors near Toronto, books donated to Durham municipal Councils, can it happen here?, collusion, Darlington hearing, defence in depth can't be counted on, emergency planning breakdowns in Japan, Fukushima book by Union of Concerned Scientists, Fukushima books to Durham Region politicians, how nuclear regulators operate, It can't happen here mantra, losing sleep over nukes, need for changes in safety analysis, nukes in the GTA, quotes from Fukushima book, quotes from UCS book about Fukushima, understanding nuclear regulators, why should people in Durham Region care about Fukushima?